Source: 1914 Maj. Chronicle Marker, Kings Mountain National Military Park, Blacksburg (SC). Photo courtesy of Adam Domby. This marker was erected as a replica of the weather-beaten 1815 Chronicle Marker. It was dedicated to the four patriot soldiers -- Major William Chronicle, Captain John Mattocks, William Raab, and John Boyd -- and the loyalist officer Colonel Patrick Ferguson and commemorated what was generally considered to be the location of their burial. This marker is a four foot tall stone in the style of a gravestone. It has a smooth front and rough cut sides and bears the inscription preserving the text of the 1815 Marker. News articles reported that little or no ceremony took place. 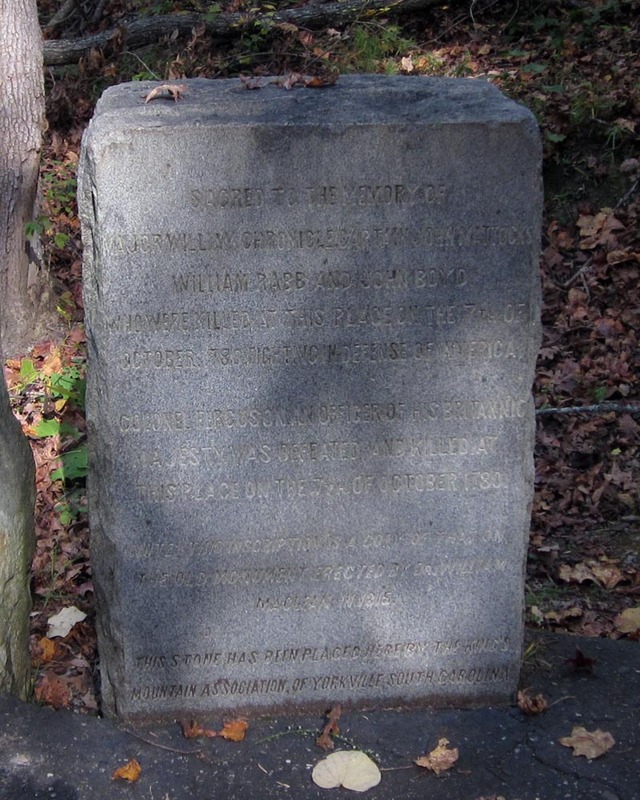 The Kings Mountain Association of Yorkville, South Carolina erected this marker to preserve the record of the earlier 1815 marker erected by Dr. William McLean and to verify the burial ground of patriots Major William Chronicle, Captain John Mattocks, William Raab, and John Boyd, and loyalist Patrick Ferguson. The face of the soft slate of the 1815 Chronicle Marker had been worn by time and weather with the inscription being lost to erosion. The new marker was inscribed to preserve the inscription of the older 1815 Chronicle Marker sitting to its left. Although the site was historically considered to be the burial place of the patriots and Loyalist Ferguson, an archaeological dig in the 1970s determined that no bodies lay below the earth under the marker. Both the New and Old Chronicle Markers sit across the trail from the Chronicle Fell Monument. The National Park Service has noted conflicting dates regarding the marker’s construction and dedication. The alternate date is 1909, around the same time the Centennial Monument was erected. An August 1909 article in The Charlotte Observer, “King’s Mountain Battleground and Its Old and New Monuments” describes the new 1909 Centennial Memorial and the 1815 marker in detail but makes no mention of an actual or planned copy for the 1815 marker. The marker is located, along with numerous other memorials, along a 1.5 mile walking trail around the Kings Mountain Battlefield on the eastern side of the park. The memorial sits to the right of the 1815 Old Chronicle Marker and faces north towards the trail and across from the Chronicle Fell Monument. The Kings Mountain National Military Park address is 2625 Park Rd, Blacksburg, SC 29702. The marker sits beneath trees amidst the heavily forested terrain of the park. Every October 7th, the Park honors those who fought at Kings Mountain by holding a morning wreath laying ceremony at the US Monument and a program in the amphitheater at 3:00, the time the battle began. There are different events scheduled in the park throughout the year.